I’ve never had to battle cancer, but I’ve had many family members - including my mother right now - diagnosed with other forms of cancer. It’s difficult to find a light side to cancer when you’re fighting for your life. Shelley Lewis, however, writes about her experience with humor and advice for a world that has marketed breast cancer. One thing that sets Lewis’ book apart is that she makes a point to say that breast cancer didn’t change her or give her a profound realization about her life; she’s the same person she was before the cancer. After talking to other women with breast cancer, she found that she wasn’t the only person who didn’t feel cancer changed her, which is quite a different conclusion than the media gives. Five Lessons I Didn't Learn From Breast Cancer traces Lewis’ treatment (it includes important information on chemotherapy and radiation) and the experiences of other women. From this, Lewis offers wise advice for others with cancer, such as using the Cancer Card. She discusses how each treatment is different (she chose the longer period of small dosage chemo so she could keep most of her hair), and how every woman will react differently. 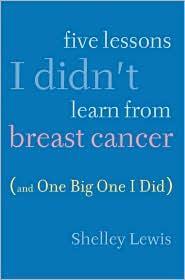 At the end of the book, Lewis includes a history lesson about how breast cancer awareness started and continues to grow. What is disturbing, though, is the inattention other cancers and diseases have gotten. And because breast cancer has been getting so much media attention, there have been conflicting images (i.e., Pink Ribbon Barbie). There is no sugarcoating of how serious breast cancer is, but has valuable advice from someone who has gone through it with a bit of humor attached. In addition, it’s a helpful book for family and friends of a cancer patient, as it gives a better insight to what a loved one is going through.